Sadly, blogging recipes is not a career for me and, like most of you, I have to work full time. As a dyed-in-the-wool foodie, this means that many nights we either go out to eat (which is too expensive and too unhealthy) or we choose convenience over taste and good meal choices. I am therefore delighted to endorse the Instant Pot, which is really just a fancy pressure cooker. 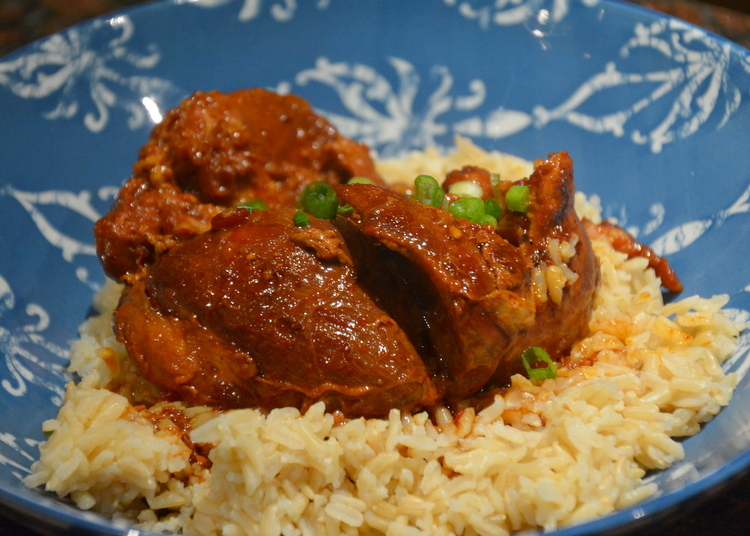 The Instant Pot will make short work of cooking rice, grains, soups, stews…nearly everything, and it is a perfect option for a cold, January night when you need to get something on the table and your chicken thighs are not completely defrosted. I got my Instant Pot today and within an hour of opening it, I had a very tasty dinner on the table. This recipe is spicy. If you do not like heat, do not use the hot sesame oil or the crushed red peppers. It will still be delicious. I used organic, boneless, skinless chicken thighs. I personally do not like the modern chicken breasts which to me, are gigantic, dry and flavorless. I also used Organic Brown Texmati Rice, which is softer than many brown rice and has a lot more flavor, while still serving up the fiber and health benefit of whole grain. My husband and I both loved this recipe, and makes enough for a second meal in leftovers. Turn your Instant Pot to sauté and sauté the chicken and whole garlic cloves in the sesame oil for about 5 minutes, turning occasionally. The chicken is not going to brown. 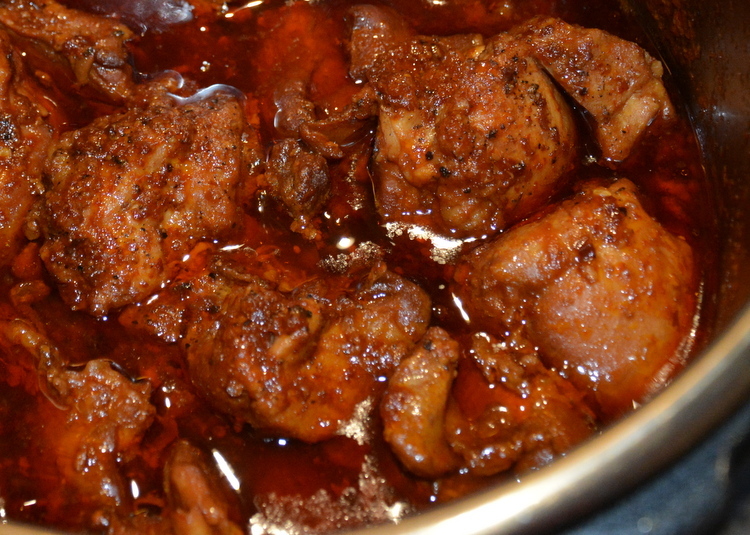 In a large bowl, mix together honey, ketchup, soy sauce, crushed red pepper, black pepper and pour this mixture over the chicken directly into the Instant Pot. Turn your Instant Pot to Poultry, cover and set to pressure cook for 30 minutes. Once you close the Instant Pot, add the rice and chicken stock to a 3 quart sauce pan and cook over medium-high heat until boiling vigorously, stirring occasionally to make sure the rice does not burn on the bottom. Once the rice reaches a rapid boil, cover and turn the heat to low. Leave it completely undisturbed for 30 minutes on low heat. If the rice finishes before the Instant Pot, do not uncover it. 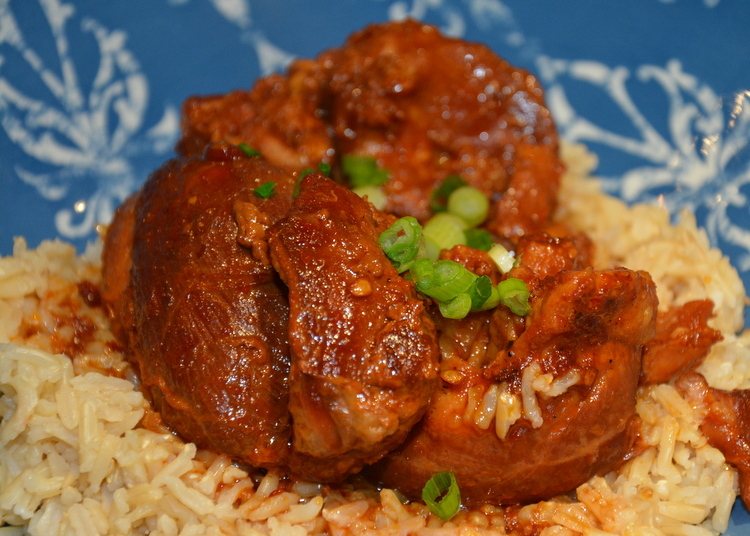 Serve the chicken on a bed of soft brown rice with just a bit of the sauce and sliced green onions.